STEVENS POINT – Changes are coming to the high school football landscape in Wisconsin, and for a number of area teams. The Wisconsin Interscholastic Athletic Association Board of Control passed a statewide football-only conference realignment proposal at its April meeting on Tuesday, making official a plan that had gained first approval by the Board last month. The Board unanimously approved its final consideration of the football-only conference proposal crafted by the Wisconsin Football Coaches Association. The plan, which will be implemented in the 2020 season, gives uniformity to the number of schools affiliated with a conference and makes certain programs have enough conference games for playoff qualification, the WIAA said in a release. The Valley Football Association will move back to two divisions, as it had been from its inception in 2011 until moving to three divisions in 2017. Marshfield will play in the VFA West, along with traditional Wisconsin Valley Conference rivals Stevens Point, D.C. Everest, Wisconsin Rapids, Wausau West and Wausau East. Appleton West and Hortonville will also be part of the division. Kimberly, Fond du Lac, Appleton North, Appleton East, Neenah, Kaukauna, Oshkosh North and Oshkosh West will make up the VFA East Division. 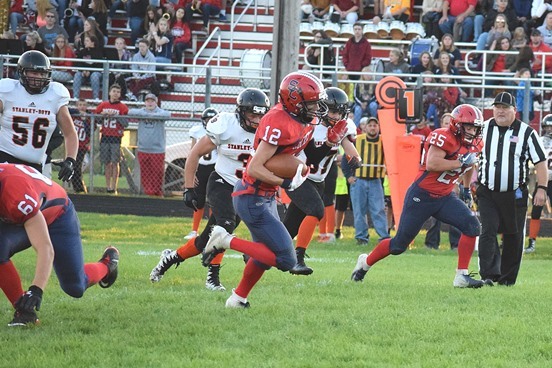 A number of other area teams will be moving conferences altogether for football, as the Cloverbelt, Marawood and Cloverwood are merged into two conferences, and some teams will be sent to the Central Wisconsin Conference as well. Spencer/Columbus Catholic will move from the Cloverbelt to the Central Wisconsin Conference Large Division, as will Marawood Conference power Stratford. Nekoosa, Amherst, Wittenberg-Birnamwood, Weyauwega-Fremont, Manawa and Shiocton will round out the CWC Large. The CWC Small will include former Cloverwood teams Loyal and Wisconsin Rapids Assumption. Stevens Point Pacelli, Iola-Scandinavia, Pittsville, Rosholt, Wild Rose and Almond-Bancroft will also be part of the CWC Small. Neillsville/Granton will remain in the Cloverbelt Conference, along with Stanley-Boyd, Fall Creek, Osseo-Fairchild and Eau Claire Regis. Mondovi, Elk Mound, and Durand will be joining the conference. The Cloverwood/Marawood Conference will be comprised of Auburndale, Marathon and Edgar from the Marawood, Colby from the Cloverbelt, and Abbotsford, Thorp, Athens and Owen-Withee from the Cloverwood. For a complete list of all of the new football-only conferences, click here.